If you asked me what comes to mind when I hear the word ‘Calabria’, I would say spicy Italian food! On the whole Italian food isn’t spicy, certainly not here in the north where I live, but down south it’s different. Calabria isn’t one of Italy’s most well-known tourist destinations but tourism is on the up there. 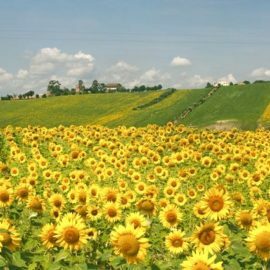 This is not surprising as the region has much to offer, most especially from a historical point of view (the whole region is covered with ancient Greek and Roman ruins, as well as Byzantine and Medieval monuments) but also from a gastronomic one. 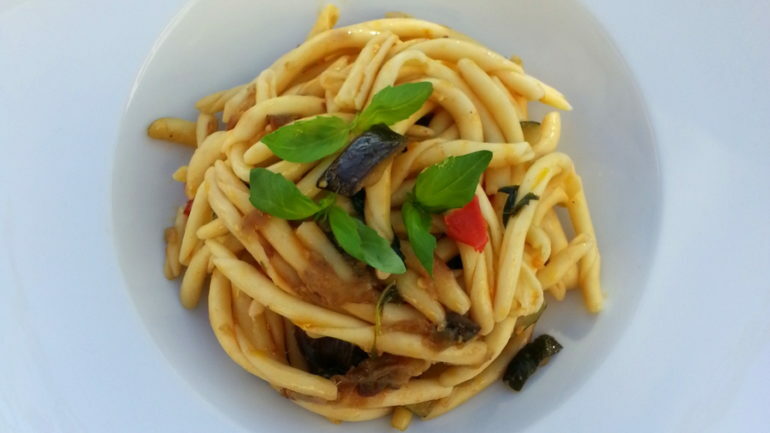 Fileja Tropeana, a vegetarian pasta recipe from Calabria! Calabrian food tends to be simple, making use of both fresh and preserved ingredients, but its hearty , extremely tasty and very often spicy. 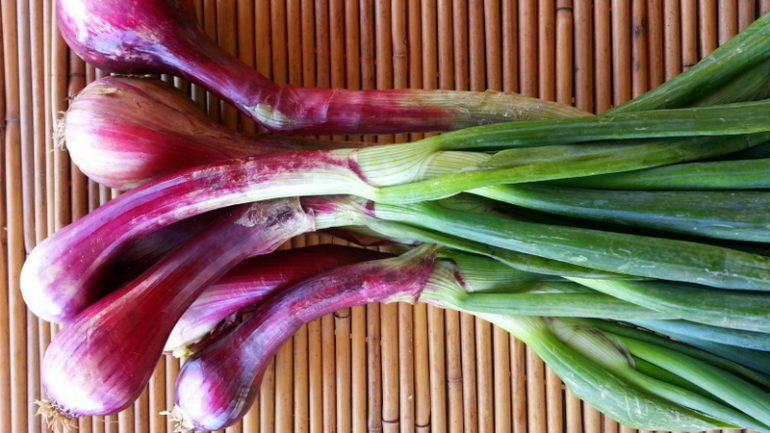 The cuisine is traditionally of peasant origin with many dishes strongly linked to religious celebrations. At Christmas and Epiphany the custom is to serve a thirteen-course meal, while for Carnival it is customary to eat macaroni, meatballs and pork. Every event in family life (weddings, baptisms etc.) 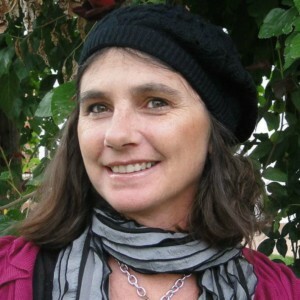 is always celebrated with a dinner or a special lunch. There are also many Calabrian dishes which are particular to the region and not really found elsewhere in Italy, probably because, over the centuries, Greek, Arab, and Albanian influences have shaped the Calabrese kitchen. Traditional dishes are laced with chili peppers, sweet-and-sour is a popular flavouring in savory recipes and desserts are often deep-fried and dipped in honey. Calabria home of the first Italians! 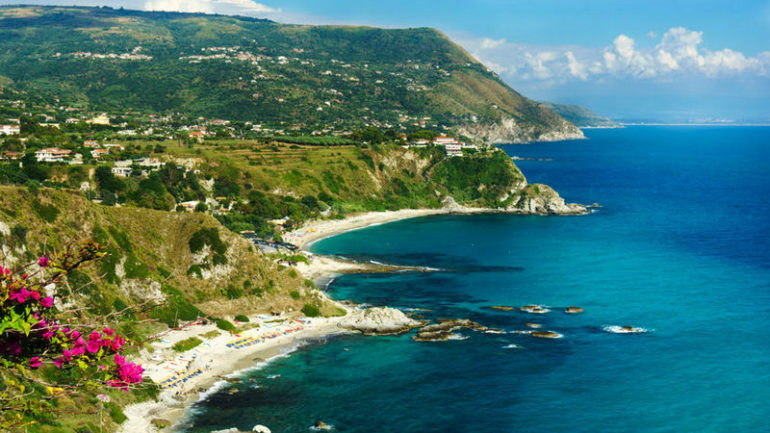 Calabria has a long and varied history which would be impossible to describe here but an interesting fact about Calabria is that the name ‘Italy’ actually originated there. During the 8th and 7th centuries BC, Calabria was colonized by Greeks. In fact the Romans called the southern part of Italy and Sicily ‘Magna Graecia’ meaning ‘greater Greece’ because the area was so densely inhabited by the Greeks. 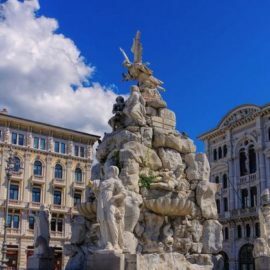 There are a number of theories about the etymology of the word Italy but in general most sources agree that it was the people of Calabria who were first known as ‘Italians’. The Itali were a people who lived in present day Calabria. Some believe that their name came from ‘vitulus’ meaning veal or calf because the area boasted a lot of cattle. So, they were the ‘young cattle people’ and the area was known as ‘the land of young cattle’. When the Greeks arrived the region was renamed ‘Italoi’ , the Greek word for ‘vitulus’. The name ‘Italia’ was extended by the Romans first to refer to all of Southern Italy and later to include the whole peninsula. Because of the heat and humid climate and the subsequent high risk of spoilage, food preservation is important in Calabria. Almost all of the region’s food products can be found preserved in some form or another , be it in oil or salt, or by curing or smoking. 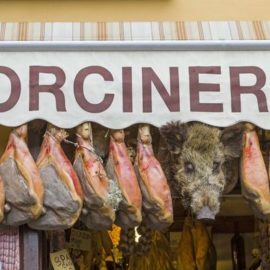 Calabria’s many varieties of cured meats, salamis and sausages are popular throughout Italy. Pork is actually the preferred meat for many Calabrian dishes and the Calabrians like to make use of the entire animal letting nothing go to waste. 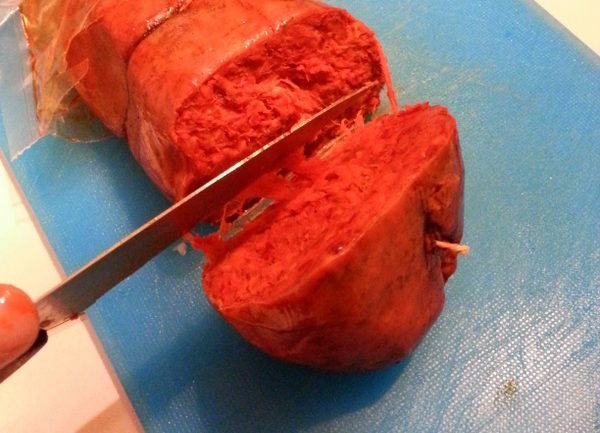 The spicy soft salami ‘nduja’ is a typical example of this. Made from pig’s fat and organ meats mixed with local chilli peppers (pepperoncini) and left to cure for an entire year, nudja is a unique product with an unusual taste that anyone who likes spicy food is sure to rave about once they have tried it! 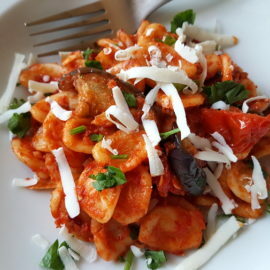 Take a look at my pasta with nduja recipe posted under Calabrian pasta and meat pasta recipes. As is true of the whole of Italy, pasta is an important staple in Calabria. 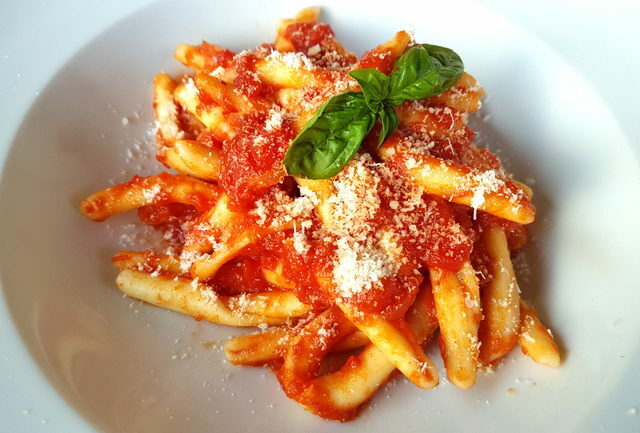 Fileja are the signature pasta shape of Calabria and the pasta dishes are rich and varied, with unusual names for some of the more creative pasta shapes such as ladies curls (ricci di donna) and hairs of the priest (capieddi ‘e prieviti). One feature common to many Calabrian pastas is the absence of eggs. Calabrians traditionally make fresh pasta with only flour and water. Hard wheat grows well in Calabria and its gluten content helps the dough hold together without the addition of eggs. 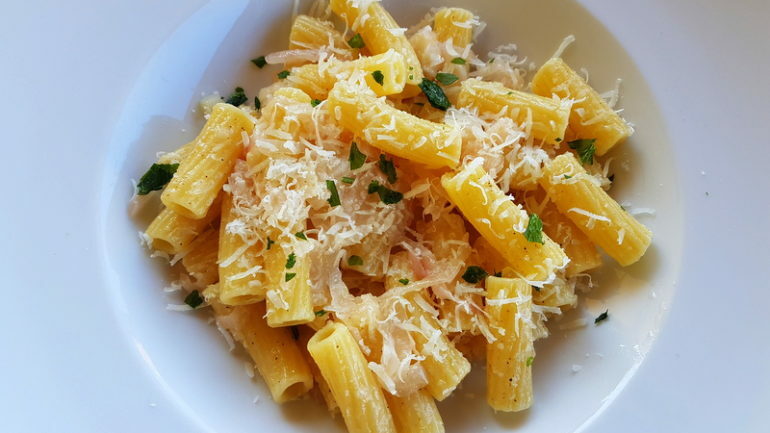 For everyday meals, Calabrians eat mostly dry pasta. Fresh homemade pasta is made for religious holidays, Sunday lunch and other special occasions. 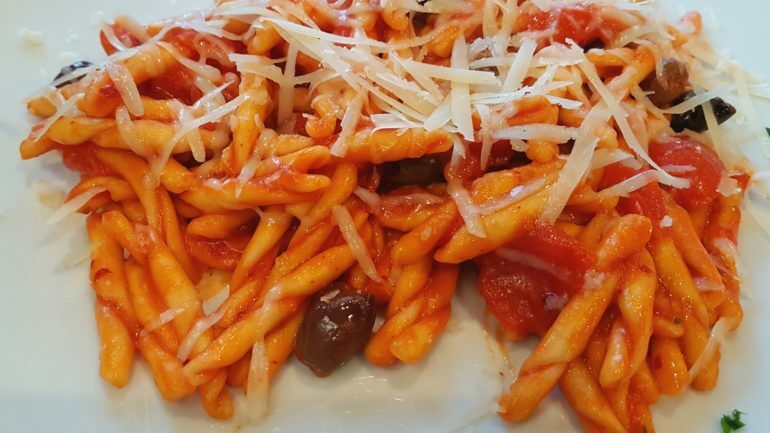 I’m looking forward to sharing some of Calabria’s pasta recipes with you and I’m sure that once you’ve tried them you’ll be putting Calabria down on your bucket list of places to go to enjoy the food.